Smart Cities want to be more inclusive. Let’s help them! Today, on World Cities Day 2017, I am pleased to announce that the Smart Cities for All (SC4A) global initiative will begin to develop a new tool, a maturity model, designed specifically to help cities worldwide assess and benchmark their level of digital inclusion and ICT accessibility. We know that today Smart Cities are not inclusive of all their citizens, particularly those with disabilities and age-related impairments. Last year, the SC4A initiative, a collaboration of G3ict and World Enabled, undertook a global study of the state of digital inclusion in Smart Cities. We surveyed more than 250 experts worldwide and less than half of them could identify a Smart City with any focus on ICT accessibility. Over the past year, my partner in this global mission, Dr. Victor Pineda, and I have been meeting with CIOs, Disability Commissioners, IT Directors, Innovation Officers, and other leaders from cities around the world, from San Francisco to Rio and from Bhubaneswar to New York. These discussions helped us to understand more specifically the challenges cities face in being more inclusive. Leaders from cities in both the global north and the global south have told us that they want to be better. They want to ensure that all the exciting and innovative Smart City programs and digital services they are deploying are available to all their citizens. But they are not sure how to do it. This new SC4A Digital Inclusion Maturity Model tool will help them. The SC4A Digital Inclusion Maturity Model will complement the first set of four tools that we launched in English last May. Those tools are now available in Portuguese and Spanish. They will soon be available in 7 additional languages. The new SC4A Digital Inclusion Maturity Model will help cities clearly evaluate their progress towards achieving ICT accessibility and digital inclusion across a broad range of functions that are important to all cities, like communications, procurement, training, and standards, etc. It will define key performance indicators and metrics to support advancing accessibility and digital inclusion. It will clearly lay out 5 maturity levels of digital inclusion and accessibility progress across multiple dimensions that are important to all Smart Cities, e.g. technology, data, culture, and strategy. We know that there is already growing worldwide interest in the new tool and our process for developing it will be robust, international, and inclusive of a broad range of perspectives and expertise. The Microsoft corporation continues to provide generous support for our SC4A work and for developing this tool. We will build on good maturity model work already done by organizations like the Business Disability Forum. We will work to align the framework for our maturity model with the broader IDC smart city maturity model being used worldwide today. In addition, the Level Access corporation has offered to support the development of our SC4A Digital Inclusion Maturity Model by contributing valuable knowledge from their own Digital Accessibility Maturity Model (DAMM). We have asked Athena ICT, Ltd. to support our work as we move forward. 1. Launching an online survey of global Smart City, disability, and technology communities. This survey will be open to anyone with an interest in digital inclusion in Smart Cities. If you would like to be alerted when we launch the online survey in November, please let us know at info@smartcities4all.org. 2. Completing a series of expert interviews with the extensive partner ecosystem of our SC4A global initiative. These experts have deep knowledge of cities, how they use technology, and how they make decisions about Smart City programs and solutions. If you or someone you know would like to be considered for one of these interviews, please contact us at info@smartcities4all.org. 3. Meeting with groups of stakeholders together through a series of smart city roundtable discussions. The first of these will be in London on November 8th and will be hosted by the Business Disability Forum and the Microsoft corporation. The following week, at the Smart City Expo World Congress (SCEWC) in Barcelona, we will convene additional group discussions. If you are interested in our roundtable discussions and will be in London during the week of November 6th or at the SCEWC in Barcelona during the week of November 13th, please contact us at info@smartcities4all.org. These are exciting times for those of us working in and with cities. World Enabled and G3ict, through our Smart Cities for All initiative, want to harness urbanization and technology trends to benefit everyone living in cities, including persons with disabilities and older persons. We believe that our new SC4A Digital Inclusion Maturity Model will contribute enormously to broader inclusion and accessibility. It will allow cities to assess their current state of digital inclusion and accessibility and then to use the results to make data-driven progress toward using technology to empower all their citizens. We hope you will join us in this important work! Read more about and by the Smart Cities for All global initiative. 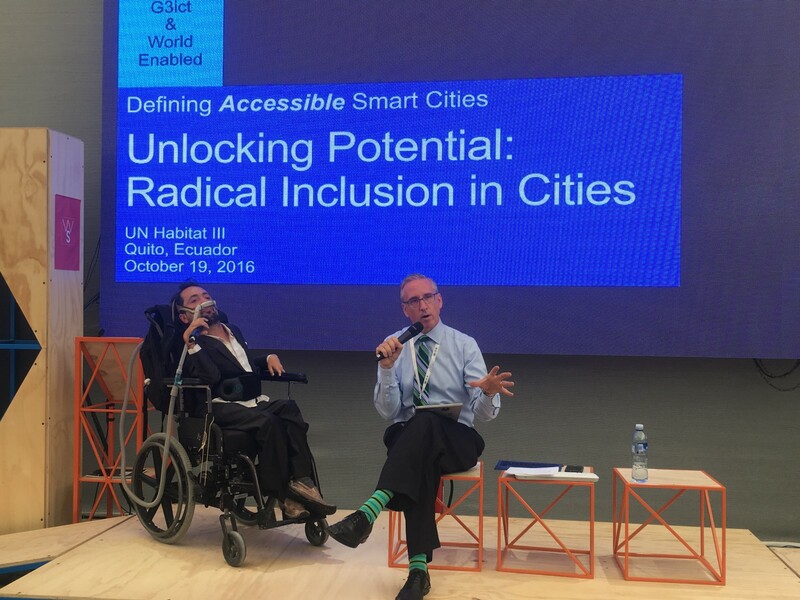 Smart Cities for All initiative is created to define the state of ICT accessibility in smart cities worldwide and to eliminate the digital divide for persons with disabilities.